If you are looking for persuasive essay topics, then your best bet is to look for the easiest topics. Remember that you are not writing an essay to advance human research, you are writing an essay to score points so that you get better grades over the year. Your job is to make it as easy on yourself as possible to get the highest scores possible. Write about topics that are very well covered because they are topics that have the most research material and resource material out there on the Internet. Once you get into High School and higher, there is no fun topic to write about that allows you to score highly. You may want to write about the Metal Gear Solid lore and help persuade people by Ocelot is actually a good guy all along, but you will not score highly for it. You will not score highly for pointing out the reasons why the Black Widow movie should be R-Rated (18 or older) because fun topics never score highly. If you cover the dullest and academic topics, then you may fall asleep while proofreading your own work, but you will score more highly and more easily. The fact is that many essay projects are boring, and many of them are a waste of your time. That is the time you could have spent revising or working on a project that matters. Our writers at UK Assignment Holic will create 100% unique content for your essays, dissertations, term papers, research paper, and persuasive papers. Let our writers, editors, proofreaders, and fact checkers do all the hard work while you invest your efforts into something more worthwhile. Ever wondered why your professor’s opinions seem to echo what you used to hear on children’s TV? Professors spend their entire lives in a college and University setting. They never experience real life, so they tend to have a softer and woollier attitude. In their mind, all people of the world should hold hand because they have never stepped onto a street where holding hands gets you beaten by people who do not know you and do not like you. After you leave higher education, you will experience real life and come to understand that your professor’s views on the world were poorly thought out, but for now, you can exploit your professor’s childlike attitude. He or she may be an expert at his or her subject, but they know bupkiss about the real world, so you simply need to echo their thoughts. Has your professor made dismissive comments about religious believers? If so, write persuasive essay topics that attack religion and god. Does your professor claim that white men killed native Americans more than a disease? If so, write a slam essay about invading white men. If your professor mentions how women are kept down, then find a few poorly conducted studies that show false facts such as how women earn less than men and write about how tough women have it. You may think these are good persuasive essay topics for kids because they are so basic, but college and University professors lap it up like a kitty with a bowl of cream. 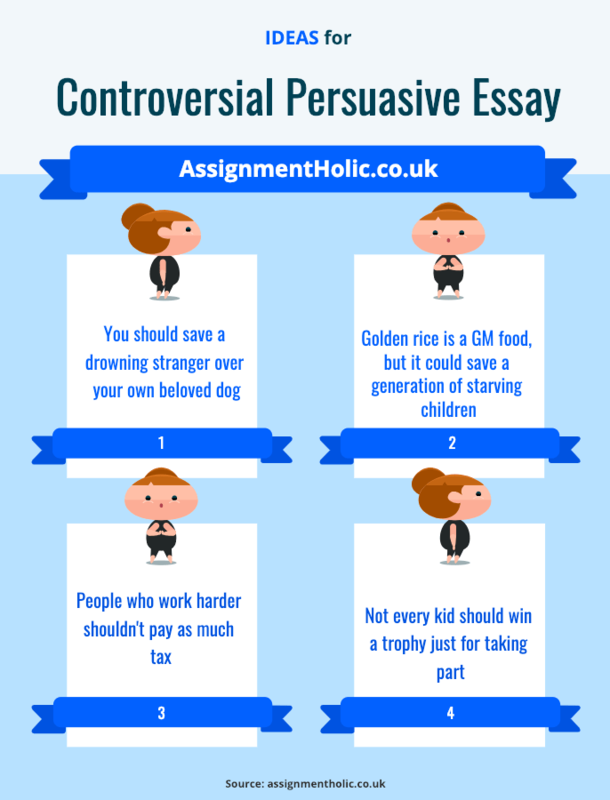 All good persuasive essay topics for kids in High school or younger must be simple, and they must cover things that have already been covered in class. The truth is that the teacher doesn’t want to teach individual students anything new, which means non-curriculum topics are a hassle for your teacher. Your teacher secretly wants you to write about things that have been covered in class because it works as a learning-apprehension indicator. Teachers have to teach you about whatever is on their curriculum, but they also have to test you and check your progress, and this is often one of the most annoying tasks a teacher has to undertake. When you write about things that have already been covered in class, you are doing some of this testing/progress-checking function for the teacher, and it also proves you have been listening in class. Most good persuasive essay topics may focus on curriculum topics to help show you have been paying attention, but there is another path you can take. Usually, a task such as this is to teach you how to write persuasive essays. In that sense, it doesn’t matter which persuasive essay topics you pick so long as they are not too controversial or adult. It is far better to concentrate on form and technique because that is all your professor is bothered about. When you are writing persuasive essay topics for middle school, look online for other essays and look for the most popular essay topics that you can write about. Look at what those other essays are referencing and use those references yourself because it makes your jobs a lot easier. You win if you pander to your professor’s sensibilities, then you will win in college. The essay topics you pick must pander to what your professor thinks, and make sure you have the technical side of your essay right. Your professor will mark your work higher if he or she agrees with you but will be unable to give you top marks if you are doing things such as referencing incorrectly or setting the wrong margins and using the wrong writing style. In addition, remember that some of the easiest college persuasive essay topics are the most boring. For example, writing a persuasive essay about how there is life on the moons around Mars may seem exciting, but researching and sourcing your essay will be a nightmare, but if you write about the horrors of greenhouse gas, then you will find more sources than you can shake a carbon footprint at. The most interesting persuasive essay topics are not always good persuasive essay topics. You may have found worlds of reference material/sources for your interesting topic, and you may write an epic of a persuasive essay. However, part of a good persuasive essay is to be able to show both sides of an argument and still come out on top. There is going to be plenty of material in favor of your topic, but you will have a hard time finding material that contradicts your topic or that goes against your topic. For example, there are interesting topics about Nanomachines and their uses fighting cancer. You could write for days about the benefits of such technology, but you will have a hard time finding material that contradicts your work. You will have a very hard time finding ways to attack your own argument, and if you cannot attack your own work, then your persuasive essay will not score very highly. If you are looking for anything controversial, then pick a topic that is to the right of the political spectrum. Leftism is all about feelings, which means its ideas are very easy to agree with. If you want a controversial topic, then pick something that favors logic over feelings. Here are a few ideas revolving around right-wing ideas. When asked, school and college students would save their beloved dog over a stranger. Some may argue that the stranger could be a bad person, but you have to press the point that the stranger is a full and complete stranger who nobody knows. Argue that human life is more important than that of a dog, and many will disagree because saving a stranger and losing their dog means choosing logic over feelings. Genetically modified food is demonized because we do not know the long-term effects of their use, but you can point out that we do know the immediate effects in that they could save a generation of African children from starving if they were allowed to be used in Africa. The typical counter-argument is that the rich should share with the poor but argue that people who work harder should be able to earn more and become rich without sharing. When you have your class in a frenzy, agree with them that people who work harder “Should” share, and then suggest that of all the students who take the next test, the top 20 scorers should share their marks with the bottom 20 scorers and see how many minds you change. The argument is that children feel bad when they lose, and that self-esteem is more important than winning. You need to argue that it isn’t just the winner who benefits when children compete. Children need to see the positive effects of trying harder. If they win a trophy just for attending, then why bother trying at anything. There are plenty of good reasons to use an essay writing service. Maybe you have been ill or unlucky and have not finished your essay. Maybe you needed extra time for another project, or maybe you had trouble at home. Some students use our essay writing services so they have more time to spend on their revising. We at AssignmentHolic will custom write your essay to your exact specifications. We write essays, assignments, and dissertations, and we do it as per your deadline. Choose our confidential writing service, or simply have our editors proofread your work. Order today and stop wasting energy on needless projects, let us write your essay so that you may invest your energy into more worthwhile projects.